A compressor can be described as an automatic volume control. By manipulating a compressor’s settings the incoming signal can be changed: louder parts of the signal can be reduced in level, leaving the quieter parts of the signal unchanged. This reduces the dynamic range of the signal. The compressed audio might then be raised in level so that the quieter sounds (or part of the sound) are louder, but at the same time, the loudest parts are not too loud, as they have been controlled by the compressor. This article attempts to explain the basics of compression, the types of compressors and some suggestions on selection, both hardware and software. My focus is mostly on hardware compressors, but the terminology and uses translate to plug-ins. Threshold settings adjust the level at which the compressor starts working. A lower threshold (say -30dB) setting makes the compressor affect more of the signal; a higher setting (say -5 dB) will affect less of the signal. Some compressors (UA 175 and 176 and their 1176 offspring, for example) don’t have a threshold control – the input control determines the amount of applied compression). This control determines what happens to the signal’s level once it exceeds the threshold. If a ratio is set to 6:1, a signal exceeding the threshold by 6 dB will be reduced to 1 dB by the compressor. A gentler ratio of 2 dB will cause reduction of gain to 1 dB as it passes the threshold. A compression ratio of 1:1 means that there is no compression. The higher the ratio, the more extreme the compression will be. Ratios from 1.5:1 up through 6:1 are usually considered to be fairly gentle, whereas ratios above 6:1 are considered harder. Ratios above 10:1 are often more used as an effect, rather than subtle gain control, and may be found in parallel compression uses, or really compressing drums or other instruments when extreme crunch is wanted. A limiter, either as an additional circuit within a compressor, or as a stand-alone device, can be thought of, in simple terms, as a compressor with an infinite compression ratio. A limiter with ‘no-overs’ setting is sometimes referred to as a ‘brickwall’ limiter. The speed at which the compressor kicks in. This is often measured in milliseconds (but is really a convenient way to reference and compare the change over time – not a precise measurement). The attack time affects how quickly gain reduction is applied as the signal crosses the threshold and the ratio setting is applied. A slow attack allows the transients of the sound to pass through largely uncompressed, but a faster attack will act quicker, and compress most, if not all, the transients (depending on the type of compressor used). Imagine a compressor applied to a snare drum. If the attack is slow, the initial crack will pass through, but the sound of the drum – the ‘body’ of the sound – will be compressed. This can give a much thicker sound to the drum. If the attack is fast, the initial stick sound – the crack – will also be compressed. Choosing the correct type of compressor to use on individual instruments is a vital part of using compression. The release time is when the compressor is reducing compression to the level set by the ratio once the level has dropped below the threshold, to the level it was before passing the threshold. Some compressors are designed so that the attack and release times are not adjustable by the user but depend on sensitivity or input level controls and the content of the program material. A compressor which affects the peaks of a sound combined with very fast changes in gain reduction is more obvious. 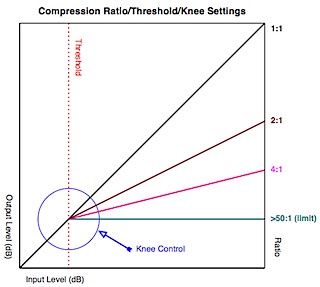 An RMS compression will average the incoming audio as its level is compared to the threshold and often the compression effect is more controlled and the compression applied to the overall sound is smoother. RMS compression is more likely to change the ‘perceived’ loudness of a signal. Enables the adjustment of output level to compensate for any attenuation caused by the compression settings. Most compressors split the incoming audio signal into two paths (Feed Forward design). One, the actual audio signal, is sent to a variable gain amplifier (VGA); the other, called a side-chain, goes to a circuit which monitors the input signal and compares it to where the threshold is set. When the input signal exceeds the threshold, the sidechain control circuit sends a command to the VGA telling it to turn the gain down and by how much (ratio). The sidechain is in fact there all the time, whether externally controlled or not. The modern reference to the sidechain has come to mean external control of that command sent to the gain circuitry to, for example, compress in tandem with another source, and/or to use the (often EQ’d) side-chain input to control the VGA. It’s analogous to having a little engineer on speed living within your compressor furiously turning a volume knob up and down. His job was eventually outsourced to the light bulb, in the early days of recording, as he wasn’t fast enough. Some compressors use a ‘Feed Back’ type of design where the control and detection side-chain circuitry is tapped after the VGA. The 1176, Fairchild and API 525 are examples of this design. The famed API 2500 stereo compressor can be switched to either circuit types. The gain circuit in hardware (now replicated in software) was based on several different types and each type has its own characteristics which affect the compressed sound and suitability for the instrument being compressed, including voltage controlled amps, diodes and photocells (‘opto’ – in fact was originally a regular light bulb) and others. Note: Some compressors are hybrids including more than one type of circuit design, or a design which doesn’t neatly fit into one of the four main types of compression listed below. Example: Empirical Labs Distressor and I would include also the Neve 33609 along with many others. More important than any of this is the audio design of the amplifier section itself. Don’t get caught in the marketing hype – if it sounds good, it really doesn’t matter what the side-chain control circuit type is. It’s the way the audio is handled that’s important, regardless of how the compressor did its job internally. Descriptions are given below just so you know the main differences. Listen to a compressor and see how it sounds without any gain reduction. Treat it like a preamp and play around, and see how it behaves as gain reduction is applied, and you change the parameters. Notice any harshness and grit as attack is set faster, the threshold and ratio are changed, and you alter the release time. VCA compressors are the most common type. The VCA is fast, and can change gain in response to many different parameters. The VCA compressor is the workhorse of compressors, and can used for almost all types of compression needs. The earliest models were literally a light bulb shining on a photoreceptor (cell or transistor) which converted the dimming/brightness into a control for the VCA. Typically, the opto compressor is smooth, not as fast in responding to changes as an FET or some VCA compressors, and depending on the model, are often used for vocals and bass guitar. The slower response time is compensated for in some designs so that the attack performance can be quite good. The most famous opto compressor is the all-tube Teletronix LA-2A, and later the UA LA-3A and LA-4 solid state optos. Examples of modern opto compressors are Tube-Tech CL 1B and Avalon. Like an ‘opto’ compressor, but without the light source, FET compressors have the common characteristics of being very fast and suitable for a wide variety of applications. They are also considered to be less ‘colorful’ than opto compressors, but this is more to do with individual models. Denotes the use of a type of tube that through re-biasing achieves compression. The Vari-mu often has a softer knee and very smooth characteristics which makes it highly useful for compression on a mix bus, and often for vocals and bass use. What is a Leveling Amplifier? Interchangeable term with many compressors – it’s really not a separate device from a compressor – it depends more on how the compressor is set, but some are more suitable than others for the ‘leveling’ application. The leveling amplifier is a compressor set to a medium attack time, a slow-ish release time, and a low threshold. The idea of a leveling amplifier is to be ‘always on’ so that the audio input is constantly smoothed. The perceived loudness of the audio becomes greater because the dynamic range is reduced, allowing for the overall level of the audio to be increased without the danger of clipping, thereby increasing the levels of quieter signals. In fact, the Teletronix LA-2A is often described as a Leveling Amp. No, they’re not. They might be very good, and sound fine, but they are not a direct equivalent. Hell, even old 1176s and LA-2s hardware of the same revision would sound different: especially tube devices as the individual components all age differently and that affects the sound. Many seasoned guitar veterans will tell you how their favorite amplifiers sound their best just before a tube blows – same goes for old tube preamps and compressors. The following references are not intended to be a suggested or comprehensive list of plug-ins – I only list those that I either own, or have used extensively, and found that for me, they are just excellent. Most of these manufacturers have demos, so try them out. Before I forget: don’t buy a plug-in unless you’ve really figured out the ones you already own and learned how to set it effectively. For example, I use Logic Pro for my usual DAW. When Logic 8 was released, Apple greatly improved the standard Logic compressor and added some new circuit emulations. The original ‘platinum’ circuit is still there for backwards compatibility, but you probably won’t want to use it, as it’s not very good. For many Logic users, this improved compressor may be all you need; it’s really quite good for a wide variety of material. An amazing plug-in, with a fairly steep learning curve. The Solera has some features not seen in other plugs which are very effective once you’ve figured out the best uses for them. For example, try out what they call Hysteresis and Angel’s Share. A great workhorse. Does most of what you want a decent compressor to do, without any fuss. Colored or clean – you’re choice. Another good plug-in. Works very well and is very flexible. Not transparent: it imparts coloration but can be quite subtle. Quite CPU friendly and low latency. Not a ‘normal’ compressor, it’s designed to emulate the sound of a tape machine. Extremely effective. The pack contains five different plug-ins all with their own unique characteristics. No AU version available. Again, not a conventional compressor plug-in, it does what it’s name suggests. But rather than only slapping it on a mix bus, try it on a drum bus as the parallel compressor, or a guitar submix. Very inexpensive, very good, very transparent unless pushed. Touted as a mastering limiter, I’ve found it highly effective on submixes. However, the lack of activity in their forum and apparently minimal sales effort is a bit worrying – grab this while you can. OK, this thing isn’t clean, subtle or transparent. It’s a beast. As Audio Damage says on their web site: “Other compressors are kittens, rainbows, and gumdrops. This one is a 40-foot-tall fire-breathing lizard.” It’s cheap. It’s outrageous on rock guitars. And I like any manufacturer who has a great sense of humor, with products which are very inexpensive, and work well. There’s even a free version of Rough Rider. There are some excellent plug-ins created by AirWindows. They are very good, no-frills, inexpensive plugs for a wide variety of uses, and are well worth checking out. There are also several free plug-ins available too.